Mississippi has a long, rich and eclectic flag tradition dating back to Hernando De Soto's trek through territory that would eventually become the Magnolia State. The magnolia tree and blossom had long been associated with Mississippi when the southern states of the United States seceded from the Union. Mississippi quickly adopted language describing a new secessionist flag that would represent first, the Republic of Mississippi, and later, the State of Mississippi both as a Confederate state and then later a readmitted US state. 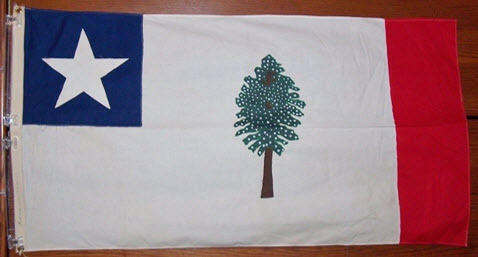 As such, the Magnolia flag in some form served as Mississippi's state flag from 1861 to 1894. Although the vexillographic language was fairly clear, at least seven stylistically different Magnolia flags were sewn together for various uses during and after the civil war. As the current Mississippi flag has been burdened with controversy, particularly through the last quarter century, there has always been the idea that Mississippi's Magnolia flag might again someday be adopted as the state's flag. This document briefly examines the seven Magnolia flags that we are aware of today and provides a speculative look at what a possible new state flag might look like based on the original. More could possibly be rediscovered in the future, but as of January 1, 2015, these are the ones we know about. Historically, we are well acquainted with several of these flags, while others are somewhat veiled in mystery. Some are plausible historical designs that could serve Mississippi well as state flags, while others, although popular, were never actually sanctioned or used as state flags or state military colors. This essay is not meant to advocate any change to Mississippi's state flag, as our current flag is very popular state wide and also has a splendid and robust history. This document is simply meant to be informational, educating fellow Mississippians that there were more than one state Magnolia flag, and what a readopted Magnolia flag might look like if readopted by popular consent in the future. 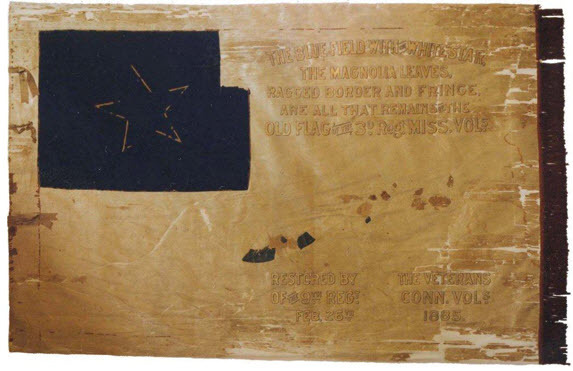 This flag was captured by the 2nd Iowa Cavalry on May 30, 1862 just north of Booneville, Mississippi. It is currently in the possession of the State Historical Society of Iowa, Des Moines, Iowa. 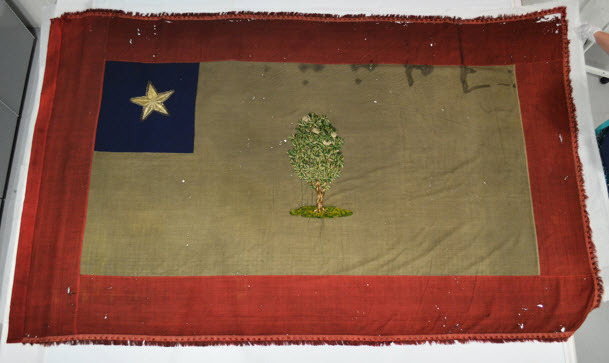 This surviving Civil War era flag matches the 1861 Mississippi State Magnolia flag description more closely than any other currently discovered surviving Magnolia sample. "A Flag of white ground, a Magnolia tree in the centre, a blue field in the upper left hand corner with a white star in the centre, the Flag to be finished with a red border and a red fringe at the extremity of the Flag". Never officially christened as a military colors, this flag was the only Mississippi "state flag" captured during the Civil War. Above is an idea of what a new Mississippi flag might look like if modeled from the "Iowa" flag. As fringe cannot technically be included in the description of a general usage flag, it is not included in this illustration. This flag was created as the military colors or standard for the 3rd Regiment, Mississippi Volunteers. It was captured by the 9th Connecticut Regiment during the Civil War. The 9th Connecticut was the first Union regiment to return captured Confederate colors at New Orleans Exposition, (World´s Fair), on Connecticut Day, Feb 27, 1885. Thus the word "restored" is gilded on the flag. Above is an idea of what a new Mississippi flag might look like if modeled from the 3rd Regiment, Mississippi Volunteers Colors. As fringe cannot technically be included in the description of a general usage flag, it is not included in this illustration. 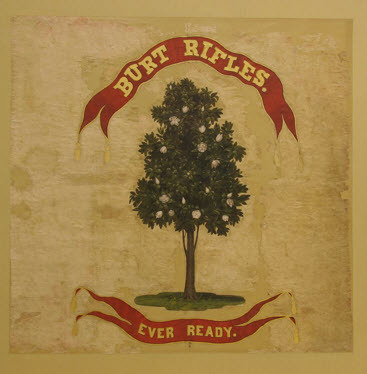 This flag was created as the military colors or standard for Company K of the 18th Mississippi Regiment, more affectionately known as the Burt Rifles, named after Erasmus Burt, who organized the regiment. The Burt Rifles saw action in numerous theatres of battle during the Civil war. Erasmus Burt himself was killed in action at the Battle of Ball�s Bluff in northern Virginia. The image above is an idea of what a new Mississippi flag might look like if modeled from the Burt Rifles color. This flag was created as the military colors or standard for the Wayne Rifles who were attached to the 13th Mississippi Regiment. Among other places, the Wayne Rifles saw action at Cold Harbor, Virginia, Fredericksburg, Virginia, Malvern Hill, and east of Seven Pines, Virginia, and Chattanooga, Tennessee. The image above is an idea of what a new Mississippi flag might look like if modeled from the Wayne Rifles Colors. As fringe cannot technically be included in the description of a general usage flag, it is not included in this illustration. This flag is a bit of a mystery. It was discovered stored in Mississippi´s old capitol building, but had no written history with it, and there are no archival references to its being commissioned or purchased by the State of Mississippi. Its physical properties make it appear to be an indoor flag. It was likely the post Civil War Mississippi flag displayed in either the House or Senate chambers in the old capitol building from 1866 to 1894 when the current Mississippi flag was adopted. Since there is no red border on this flag, it does not meet the original 1861 description of Mississippi�s flag. 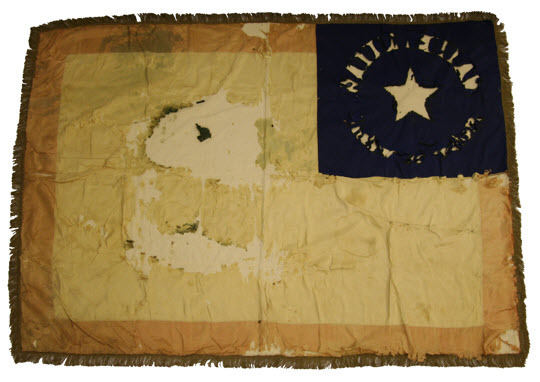 Nevertheless, here it is, an actual surviving Magnolia flag. Why the red border was removed is currently not known. The image above is an idea of what a new Mississippi flag might look like if modeled from the Magnolia White flag. As fringe cannot technically be included in the description of a general usage flag, it is not included in this illustration. This flag was possibly created as the military colors or standard for the 1st Mississippi Cavalry. The unit saw action in numerous theatres of battle during the Civil war. 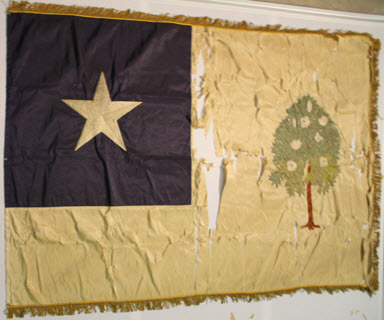 Additionally, there are no actual surviving samples of this particular Magnolia flag, only illustrations. The image above is an idea of what a new Mississippi flag might look like if modeled from a possible 1st Mississippi Cavalry Colors. As fringe cannot technically be included in the description of a general usage flag, it is not included in this illustration. Although the most popular and recognized of all Mississippi Magnolia flags, this flag ironically has no sanction relative to the Civil War itself. Furthermore, although listed as the military colors of several Mississippi Confederate units, there are no actual surviving samples of this particular "colors" to give that supposition credence. That does not mean that the flag never existed. 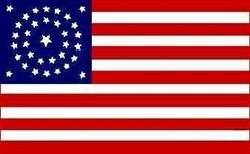 It was likely a post war flag, designed for use by one or more of Mississippi�s United Confederate Veterans units. Then over time, it was mistakenly identified as "the" Magnolia flag. The image above is what a new Mississippi flag might look like if modeled from a possible post war Mississippi UCV flag. As fringe cannot technically be included in the description of a general usage flag, it is not included in this illustration.